Editor’s Note: This post is featured on the Disney Blog Carnival #40. Read more great posts about all things Disney! The next carnival will be Feb. 20. Submissions are due on Feb. 18! I’m pleased to have my hubby Brett back as a guest blogger today. 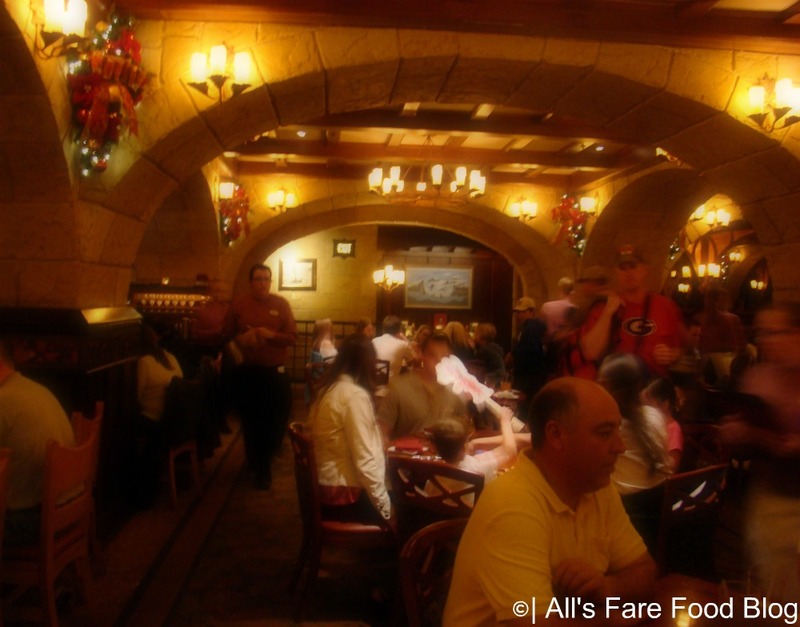 He looks back at our most recent memorable meal at Le Cellier, a popular steakhouse at the Canadian pavilion at Epcot’s World Showcase. Have you ever had a meal that left you speechless? One that you enjoyed so much that it is almost impossible to put into words? If you haven’t yet then I hope it happens for you. A great place to have one of these out-of-this-world experiences is Le Cellier at the Canada pavilion in Epcot. On our most recent trip to visit Mickey, my father, wife and I had reservations to the steakhouse. This was my second trip to the restaurant. I also visited on my Disneymoon and it wowed me all over again. When you first walk into the seating area of the restaurant, you actually get the feeling of being in a cellar. The walls are adorned with dark wood and wine bottles jutting out from all sides. The lighting is very subdued to the point that you might have to take out your phone and use its light to view the menus. All of this builds to the ambiance and enhances your meal that is to come. All of three of us chose to begin with a starter before our meals. My father chose the Selection of Beets appetizer, my dear wife went with the Assortment of Artisanal Cheeses and I dined on the Canadian Cheddar Cheese Soup. 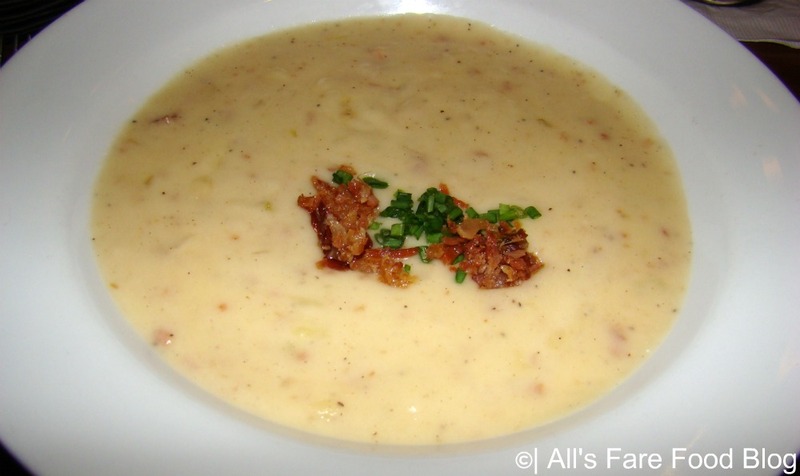 The cheese soup was so rich and creamy I could have had only that and been satisfied. It is made with Moosehead beer and smoked bacon. Be sure to save some of the breadsticks they put on your table when you sit down so you can mop up any leftovers in your bowl. Once you try some, you won’t let any go to waste. My wife’s Artisanal cheeses touched every part of the palate. 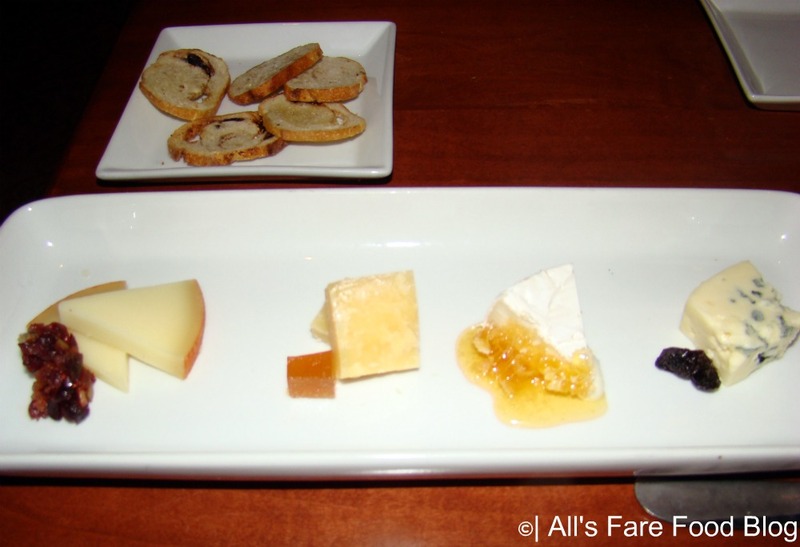 The four cheeses ranged from mild to bold: the Beechers Flagship Reserve Truckle, a milk cheese served with a pear jam; Woolrich Goat Brie; Smokey Oregon Blue, a raw milk blue cheese served with raisins on the vine; and the Petit Agour, a semi-hard shee’s milk cheese paired with an apple-cranberry chutney. Each cheese was top-notch and so fresh you could imagine the restaurant having livestock on-hand so they could make the cheese in-house! My father’s assorted beet appetizer was so good that he was done before he realized that he hadn’t offered any to the rest of us. He swears to this day that he asked if we wanted any, but we all know the truth. 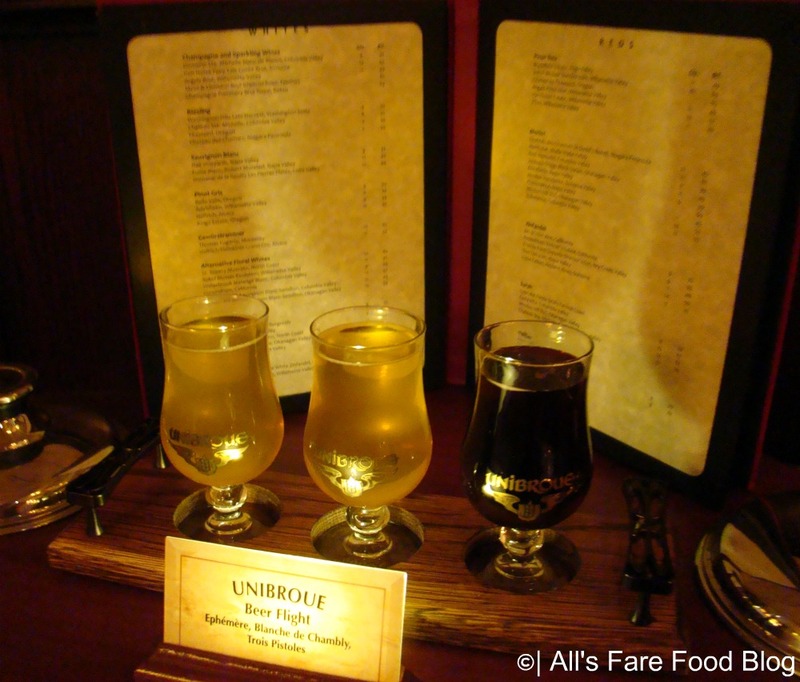 (Pictured above) My dad ordered the Unibroue beer flight: Ephemere, Blanche de Chambly and Trois Pistoles. These three variations of Canadian beer included two infused with apple. Our waitress told us that to make the apple beer they use the peel instead of the pulp, which maximizes the apple flavor. Boy was she right! Now we get to the main courses and what Le Cellier is known for, STEAK!! 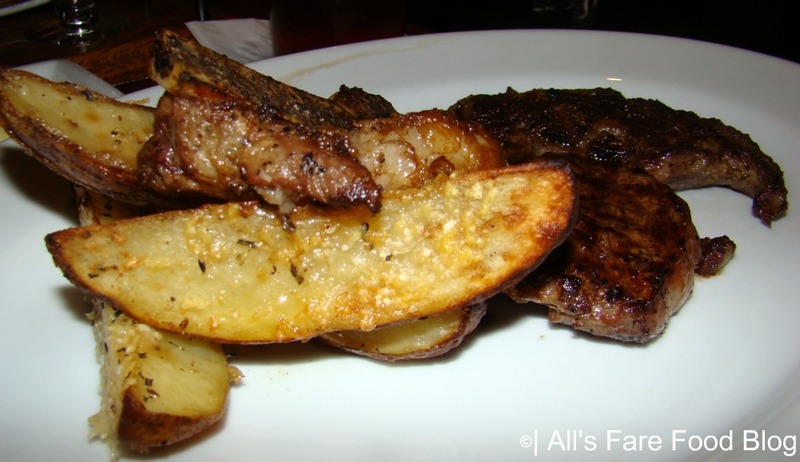 I went with the Grilled Bone-in Ribeye with herb-parmesan potato wedges and maple-pink peppercorn butter. The steak was cooked perfectly to my desire and after one bite I knew there would be nothing left on the plate. The steak melted as you chewed. I learned from a young age that you should always chew your food, but you hardly needed to with this delectable meal. The potato wedges were crispy on the outside and silky smooth on the inside with just the right amount of seasoning. 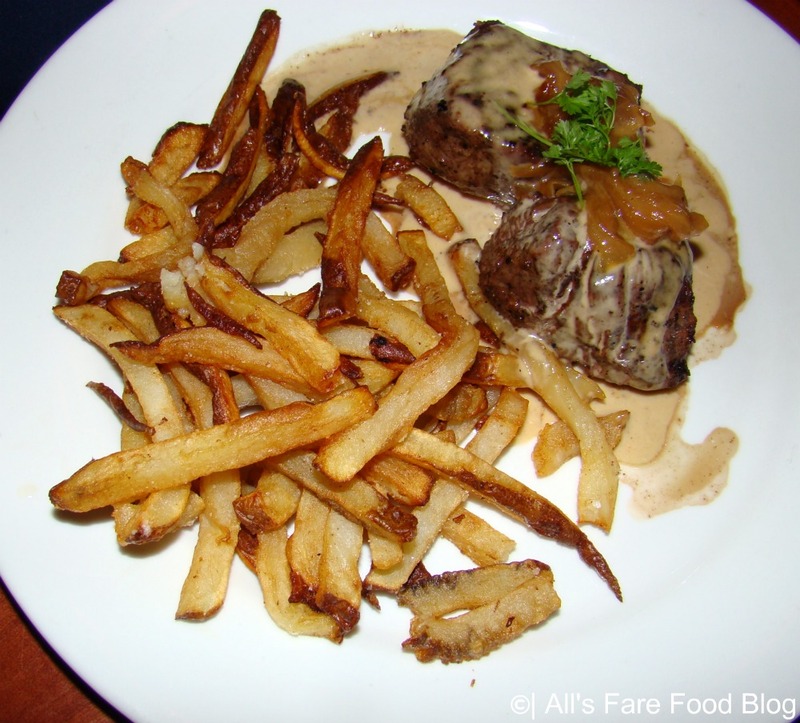 My father opted for the Medallions of Beef Tenderloin with caramelized onions, pommes frites and au poivre sauce. I wish I could tell you how great this meal was, but alas my father wouldn’t share any. I offered him a piece of my steak for a piece of his. The response I received was, “No, because then we would just be sharing steak and what’s the use in that. Plus, I don’t want to share any of this because it’s so good!” My father who is not the biggest eater anymore finished everything on his plate. There’s no better review of a meal than that! 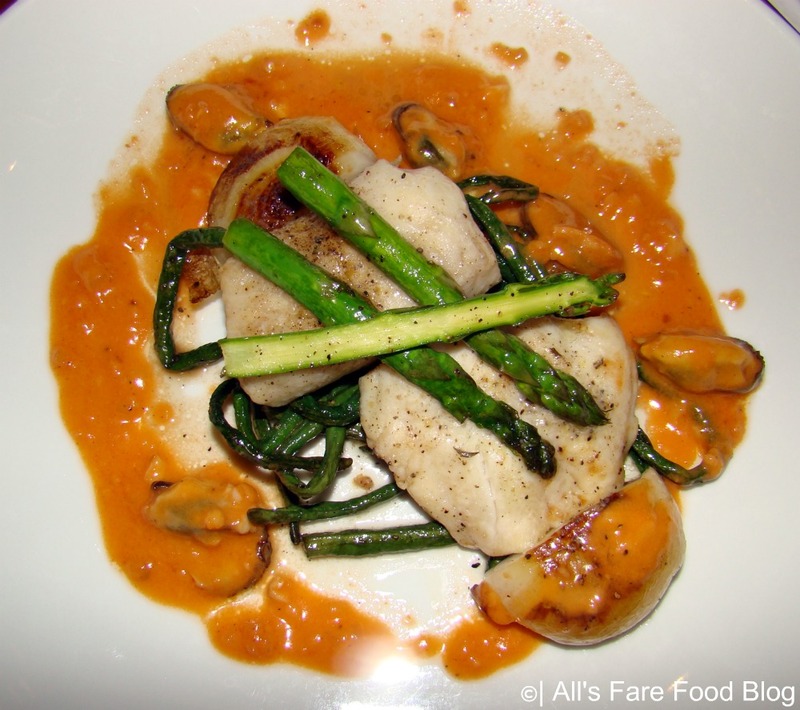 My wife decided to go for lighter fare and selected the Broiled Sablefish with long beans, cipollini onions, asparagus tips and shellfish butter sauce. The fish was very tender and the butter sauce enhanced its flavor. The long beans were unusual compared to your regular green beans. As the name implies they were abnormally long. The only downside to this dish was that it was very salty. We’re not sure if that’s because sablefish is a saltwater fish or if they put too much salt in while cooking the meal. Amazingly, my wife and I saved enough room for dessert. I have no idea how we fit anything else in, but we did. My wife went with the Chocolate Moose and I indulged in the “Holiday” Heirloom Apple Tart. The Apple Tart was sugary sweet and hit the spot. It came with a Vanilla Panna Cotta and Salted Caramel. 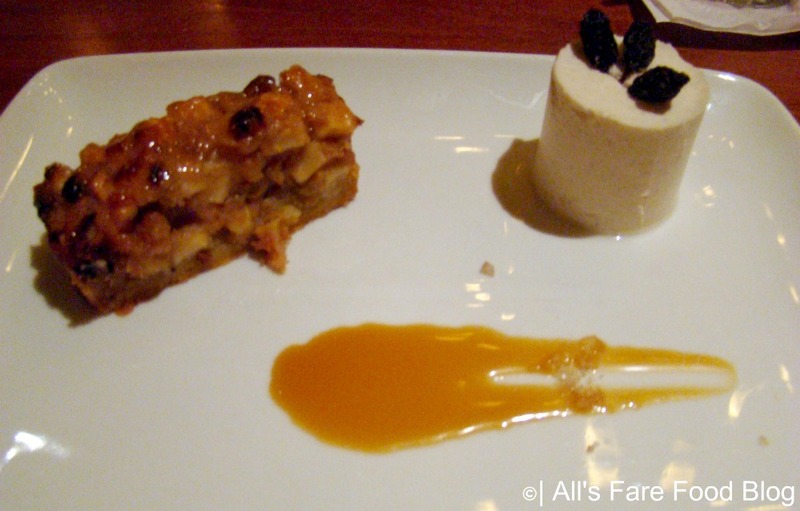 The Panna Cotta was like eating silk and the saltiness of the Salted Caramel was a perfect offset to the sweetness of the Apple Tart. 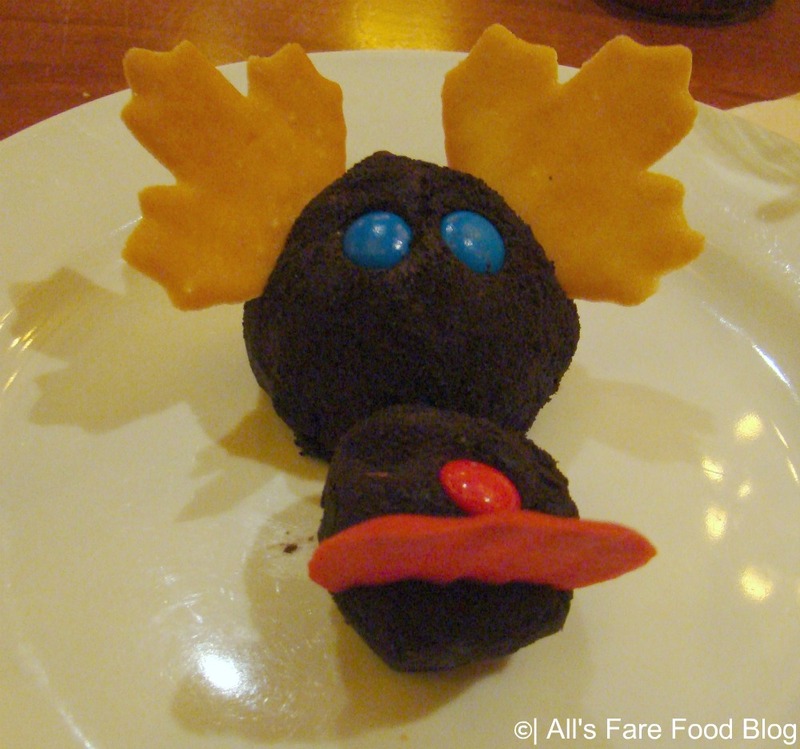 The Chocolate Mousse comes in the shape of a moose with maple leaf cookie-shaped antlers, chocolate candy eyes and a red cookie shaped tongue. Come on, it’s the shape of a moose. That’s so cute in itself it needs no other review! I need to include a little piece about our waitress. She was so attentive and really took the time to get to know us. While chatting with her, we learned that she is from Vancouver Island. I couldn’t resist the chance to pick on her about my Boston Bruins beating her Vancouver Canucks in the Stanley Cup Finals. She laughed it off and told us that after crying for a while, she Skyped with her family who were all stunned and cried the whole week. She took it like a real sport and threw it back in my face that the Canadian team beat the USA for the gold medal. I say this story to you in the hopes that when you dine at World Showcase at Epcot you get to know the wait staff. They usually are from the country that you are dining at and all of them have great stories to share about their homeland. 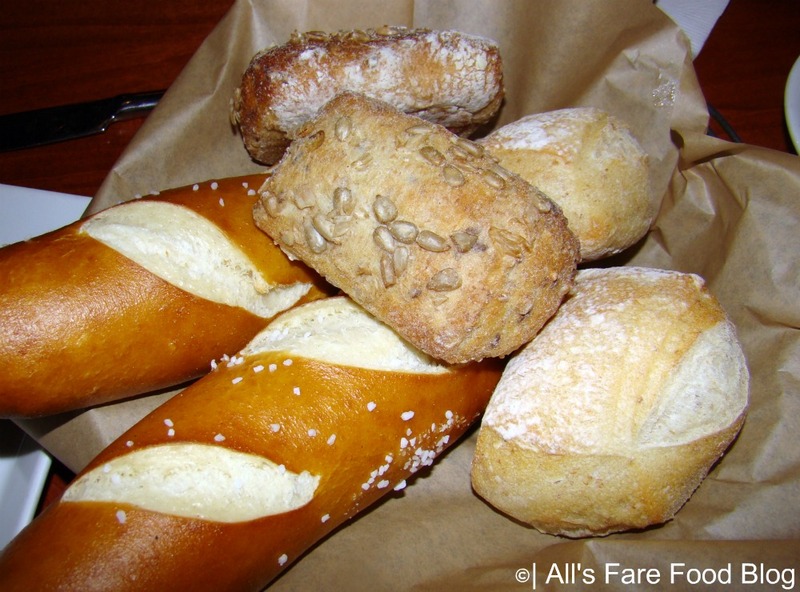 This entry was posted in Disney, Disney World and tagged beer, Brett Finnell, cheddar cheese soup, chocolate, dessert, Disney World, Epcot, Le Cellier, moose, pretzel breadsticks, steak by Christina. Bookmark the permalink. 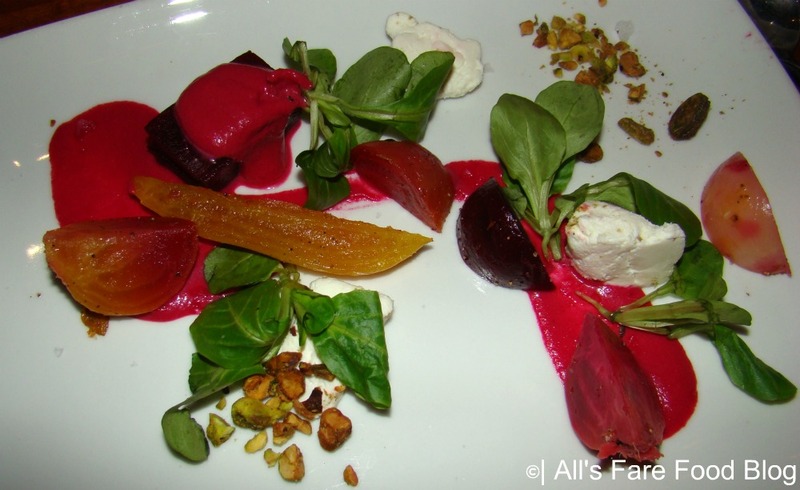 Oh that cheese tray and the beet salad look amazing! Oh don’t make me change my March reservations!? 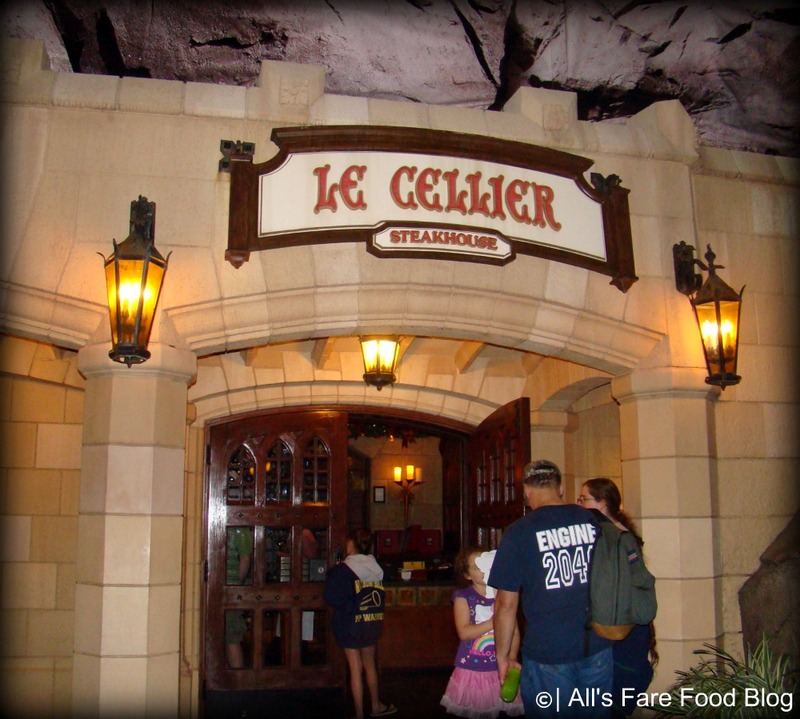 We’ve been to Le Cellier twice, and we are going again! We are going back to Disney this summer with three first timers, my twins and my father in law. My wife can’t wait to get some more Canadian Cheddar Cheese Soup. She likes it so much she had me make it for my blog. I wish I had the time to make the Pretzel Bread sticks too. We asked if they could email us the recipe for the soup but still haven’t received anything. Is it the same recipe as in the “Cooking w/ Disney Chefs” book? It’s similar, It was a little too thick using the instructions from the “cooking w/ Disney Chefs book”. I used “Delicious Disney” Recipe. Uses a bit more stock in it. You just have to tinker a bit, as ingredients can be finicky.